Reagan slept well last night and woke up this morning seemingly OK. Still very serious and tense, but quiet. That didn't last long. I was upstairs talking to the nurse and all of a sudden Reagan broke out into full on screaming crying! I definitely think us talking triggered it, but there was obviously more to it. She seemed to be having tummy pains (or something) that would come and go. She'd be OK and then start screaming again. Over and over. Nothing really seemed to help (oxycodone, ibuprofen, or clonidine) until we tried Lortab this afternoon. She dozed off and slept for a bit. When she woke back up, she was still very tense, but calm (and a little dazed/out of it). She eventually snapped out of it and then was making really great eye contact with Grandma. She was OK the rest of the night. Not happy by any means, but content. Whatever it was that was hurting her so, seemed to have passed. She fell asleep in my arms and I transferred her to her bed all wrapped up in her weighted blanket. Hopefully that will help to keep her asleep tonight (instead of just making her sweat)! Hoping for a better day tomorrow for my sweet girl! Reagan slept well last night (thank you God)! She woke up this morning still very serious, but calm. She was a little more on edge in the morning, but got better and better as the day went on, and seemed considerably calmer after a bath with Grandma. She was very calm and still most of the day but her temperature regulation was way off. Sweaty back and cold hands and feet. When her nurse left tonight she mentioned that she was running a fever, so hopefully she's OK and she didn't pass anything on to Reagan! Tonight Reagan started getting a little tense again, so I rubbed some Gentle Baby essential oil on her feet and put some Stress Away essential oil in her diffuser and sure enough she settled down and seemed to feel much better. She was pretty calm and laid back the rest of the night. We hung out in her room with Grandma and watched Frozen (trying to keep her away from any germs her brother may still have). She dozed off on her own around 10:45pm and we were able to successfully transfer her to her bed. Hoping for another good night's sleep for my girl! 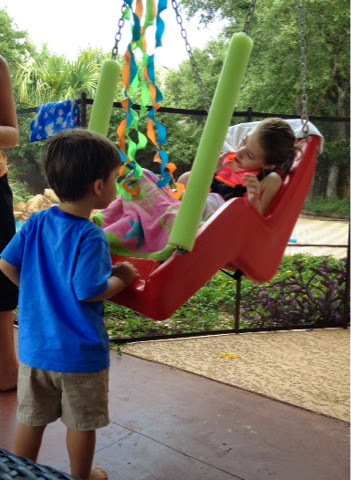 Reagan slept well again last night, but her brother was up again playing in the wee hours of the morning! She's had another good day today for the most part. She had a big giant messy poo right before we had to leave this morning, requiring a quick impromptu bath. Then we were off to her ketogenic diet appt. I waited in the waiting room while Reagan and her nurse sat in the hallway for an hour...the office was insane...there was no way she could tolerate that chaos for that amount of time! Thankfully the hallway was only temporarily noisy (as people were coming and going from the office), so she tolerated that just fine. Once inside, they took her weight. She's still at 47.96lbs, which is higher than I would have guessed after being on the reduced calorie formula for three weeks. Then we met with the dietitian. She just went over a few basics that we already knew. One new thing is that the formula is now a liquid (instead of a powder), so that should make things a little easier. Reagan won't have to go in patient to get on the diet since it's such a low ratio. She will however have to get labs drawn at the beginning and on a fairly regular basis, but we're hoping we can do those at the same time as her Stanford labs. We discussed her total liquid in take and we may want to try to increase that a bit. She's bee at 1100mls for a while now and the dietician said that for her age/weight 1500mls is more appropriate. They try to stay on top of fluid levels with the diet because it can be constipating (great), but maybe by increasing her fluids, that will help her all around. The plan is still just to hold tight until we notice a downward trend with the current formula regimen and then we'll talk about initiating the diet. 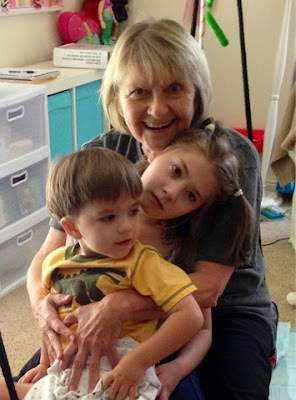 When we got home from our appt, Grandma was waiting for us (a day early)! Reagan was happy to see her, although she did get a bit excited. She was great for the rest of the day and then just as the nurse was about to leave, she started getting a little on edge. She had some tears and then another poo (3 total for the day) and that seemed to help her settle down a bit. Poor thing. Her tummy does give her troubles! I was afraid she wasn't going to loosen up enough to fall asleep, but Mike laid down with her and she eventually dozed off! Hoping she can stay asleep and wake up feeling much improved tomorrow! 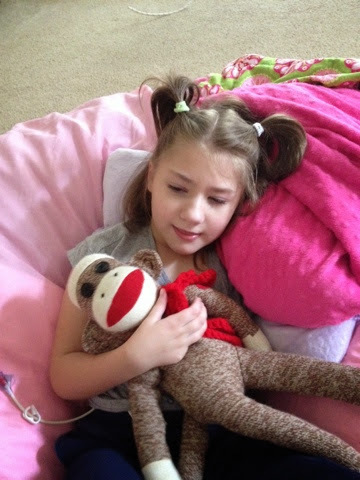 Reagan slept well last night and woke up sweet again this morning! 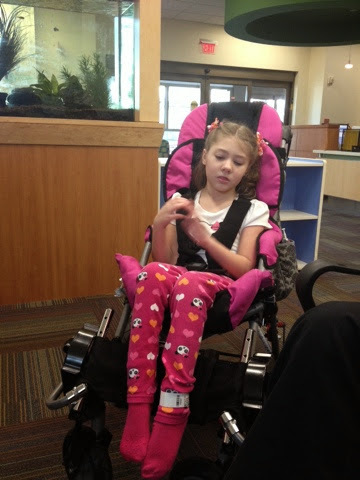 She had a busy therapy day with sessions of PT and vision and then a late afternoon session of school! She did great with everything! Ryan didn't sleep great, he was awake at 3am, but at least he was content and not crying. He woke up and proceeded to get warm and then covered again in hives. After a dose of benedryl and motrin, he was good. He actually passed out cold on the recliner. I moved him to his bed and he napped the entire time we were gone at Reagan's ENT appt (Grandpa just watched golf/tennis)! Reagan did great with her appt, even with her doctor talking REALLY loudly (I guess he's used to dealing with people who are hard of hearing)! But the general summary of the visit is that her hearing is normal. Yeah for normal! The ABR came back fine and her ears look good, so unless there's anything we are worried about, no need to go back to ENT! Woo hoo! We came home to find Ryan still asleep, but boy was he cranky when he finally woke up! (That's how I feel after benedryl!) He eventually chilled out with a lot of Cat in the Hat and iPad! (It's time to cut back on that again, he's getting a little out of control!) Reagan was good all day, a little vocal, but I think she just wanted constant attention! (Who doesn't?!?!) Hoping for another good night's sleep tonight and a good day tomorrow as well! Reagan actually had a pretty good day today! 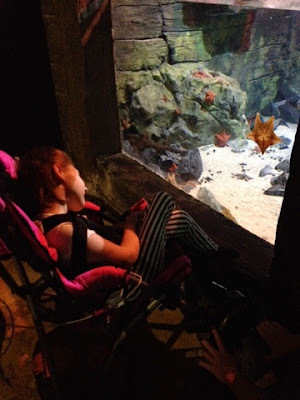 After her day yesterday, we didn't know what to expect, but we were pleasantly surprised! She slept well and woke up this morning feeling much improved! She did well with speech and then we helped her have a poo (she was really backed up again) and then we did an early bath! She was all nice and clean and ready for her afternoon dental appt (although a little hiccuppy). Her brother, on the other hand, decided to throw us for a loop! He had been a little difficult this morning, fussing, not wanting to eat much, and even acting like he was going to throw up at one point! Then I noticed a little hive in his diaper area, the next thing I knew, he had hives popping up all over (on his legs, face, stomach, feet, back, etc)! So as I was trying to figure out a way to get him to take benedryl (I had to find the right dilution in juice that he will still drink), he started spiking a fever! He was getting hotter and more miserable by the minute! He wouldn't touch the juice with Motrin in it, but did eventually drink his whole dose of Benedryl. Mike took off work and came home to take him to the doctor. He was SO pathetic! The doctor really thought it was strep (because he has the nasty tonsils covered in pus again), but the strep test was negative, so they just think it's some sort of virus. Now I guess I know why he was acting gaggy...his throat hurts! While he and Daddy were at the pediatrician's office...me, Reagan, and her nurse went to her dental appt. Her teeth look good, but she is long overdue for a cleaning/x-rays (it's been years), however, her dentist doesn't want to put her under anesthesia just for that. So we'll wait and see if anything else comes up that we can do at the same time. Meanwhile, we'll just plan to go back in 6months for another checkup. After her dentist appt, we headed over to the hospital for the care conference with all of her doctors (palliative care, neuro, GI, and metabolics/genetics). The neuro was the first there so we spoke a lot about the ketogenic diet. I forgot everything that goes along with that...switching all of her liquid meds over to pills (so there is no added sugar/carbs)...it's going to be a pain. He agrees it's worth a shot. We also talked about possibly having to rotate her formulas, every four months or so, to keep her in that "honeymoon" phase. For instance, we just switched her formula and she's already doing much better than she was before. So the plan with that is to hang tight on this formula for now, begin increasing her rate (so she doesn't lose any more weight), and then meet with the ketogenic diet people on Friday and come up with an exact game plan so we have something to switch over to if we see any downward trend. 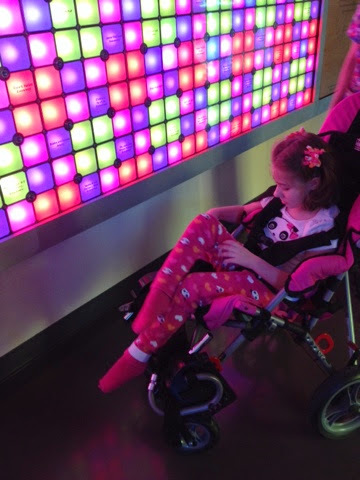 She wouldn't be on a typical ratio like for seizures (4:1 or 3:1), she'd be closer to 1:1 or 2:1, so it's not nearly as difficult. So we'll see. We have a plan for now. The metabolic dr also wants to get a urine sample on a day we smell the "bad day smell" and look for urine organic acids. So that's our plan. Reagan was great during the meeting and just hung out with her nurse in the hospital's library! We did get stuck in 5 oclock traffic on our way home, but she was great. Ryan seemed fine by the time we got home and he went down without a fight tonight (but that might have been because of the 10min nap he had this afternoon). Reagan and I spent the night quarantined to her therapy room. She dozed off once fairly early, but woke back up when I laid her down, but fell back asleep in my arms after clonidine. Such a sweet girl. Hoping both kiddos get some sleep tonight! Reagan slept well last night...never woke up from when we first laid her down! When she woke up this morning, however, her mood was not good. She was very tense and crunchy and there were no smiles to be found! The silence didn't last long and before we knew it she was in a full blown bad day! Her nurse gave her some oxycodone but it didn't seem to do much. She cried for a full 45min or so and then literally 1min after she got a dose of Ibuprofen, she fell asleep! (So it's doubtful that it was actually the ibuprofen!) She's slept most of the day today and that's a good thing! When she woke back up around 3pm, she wasn't crying, but was as tense and miserable as she could be (thrashing, biting, flailing) without actually crying. Another dose of oxycodone and 30min or so later, she was back asleep again! Poor baby! Very rough day. She slept until just before 7pm. She woke with a lot of thrashing and a pained/startled look on her face, but no crying. It took a while for her to finally doze back off...lots of essential oils and oxycodone! She's still asleep at the moment, but keeps moving around in her sleep, so it may not last much longer. Please say some extra prayers for my girl! Sleep last night just wasn't happening for my girl. I woke around 2am to hear her rolling around hitting the side of her bed. Considering the retching I had seen a few hours earlier, I didn't think it was wise to leave her awake in her bed. I moved her to her chair and tried giving her a dose of Lortab in hopes that it would settle her down and help her to fall back to sleep. No such luck. She was awake the rest of the night. Other than being awake, she seemed fairly stable, so I decided to go ahead with her scheduled gastric emptying scan (8:30am arrival for a 9am start time). I switched her over to pediatlyte around 6am and then we disconnected her completely around 8am. We fought our way through first day of school traffic and amazingly enough, got to Dell with time to spare. This is the second time we've done one of these scans at Dell (the first was 1/27/14), her GI doctor's thinking was that maybe with the increased nausea we've been seeing (which has been better since switching formulas), maybe she's having dumping syndrome. To be honest, I didn't really see any need to do another one of these tests, but I just went along with it (it's a fairly noninvasive test). Reagan was great! Other than a little licking/smacking, she did fine during the entire hour of laying flat for the test! Afterward (while they checked with the doctor trying to decide if they needed to do any more pictures...sometimes they do another scan or two an or or more after the initial one), we walked around the hospital and looked and the light-up butterfly wall and outdoor courtyard/waterfall. By the time we got back from our little excursion, they told us we were done and we could leave! (So based on that, I'm assuming the scan was normal, but I guess I'll find out more at the care conference Wed!) Reagan was great in the car and when we got home she seemed a lot more relaxed in her body and obviously tired (her poor eyes were completely bloodshot). Her nurse had her on the floor stretching her and playing with her switch toy and she seemed to be enjoying herself! Then all of a sudden she started whimpering, and next thing I knew we had full blown tears! Not sure what it was, but she definitely seemed to be in pain! Her nurse gave her some oxycodone and she eventually settled down and fell asleep (but she was very easily startled in the process)! She woke up once for 15min or so and was still looking very wide eyed and excitable, but thankfully she dozed back off without any major freakouts! As of now, she's sleeping soundly in her bed! Praying she gets some much needed rest! Reagan was very restless again last night! I'm thankful that she at least tolerated laying in her bed, but I really don't think she got much sleep! Today has been very similar to yesterday (and the day before). She's sweet and even a little smiley, but you can definitely tell that her body is "off". The chorea has increased a lot (she's kicking, kicking, kicking) and overall her body is just plain tense! Her temperature regulation is also still WAY off (cold hands and feet, super sweaty back). She did not do as well on the floor today as she was a little more spitty/chokey. Tonight she also gave me several big retches and I thought for sure she was going to throw up, but she never did. She was very resistant to medication tonight as well. I gave her oxycodone to try to calm her down around 7pm...it did nothing! Then around 10pm I gave her clonidine...again nothing! Finally around 11:15pm she started looking sleepy and Mike laid down with her and was able to get her to sleep! No idea how long this will last, but I need to get to sleep soon!! Reagan slept OK last night. Still pretty restless, but at least she was in her bed. She's been a little more sensitive today. Not a fan of us talking (almost freaked out once this morning when I was talking to her nurse) and had a huge crying meltdown tonight because of brother's noisiness. A little spitty/nauseous, making lots of mouth movements but no actual retching. She's definitely more tense in her body (we think she's still having tummy pains) and her temperature regulation is way off again (hands and feet super cold and clammy but her back sweats wet in minutes)! Tonight she preferred to be on the floor kicking around. I tried hold her a few times, and she made it clear that she preferred to roll around on the floor! Still having lots of gas, so I helped her poo again (her nurse gave her 30mls of milk of magnesia and still nothing), and I think she HAD to feel better afterward! She was resisting sleep tonight so I have no clue how much sleep she's going to get! At this point, I'm just praying she'll tolerate being in her bed! Tense but hanging in there! Reagan was still a little agitated last night but eventually calmed down with the help of Lortab (that clonidine...we never know when she's going to have a negative reaction to it)! I woke up at 2am to the sound of her pump beeping, thankfully it didn't wake her up! She was sleeping, but restless, and that's probably how she ended up with her tubing wrapped around her arm (which resulted in a kink, hence the beeping)! When I got back from my run at 7am, she was still sleeping (eyes were closed), but she was moving around a lot. By the time I got out of the shower, she was up! She was in a decent mood, still tense, but calm. She did freak out a bit this morning when I was talking to her nurse! Definitely didn't like us talking around her...she just wants us to talk TO her! I managed to calm her down fairly quickly and she was fine the rest of the morning. She didn't have a super successful session of speech (go figure), but she did do pretty well with PT. Her nurse used some of the "Relaxing" essential oil spray we got the other day and she really think it helped settle her down when she was getting worked up! Hoping we can keep her calm but if she's going to go there, it's better she gets it out of her system over the weekend! We've got a super busy week next week! Reagan woke up last night around 2am and was rolling into the side of her bed over and over again. I decided to go ahead and give her her nighttime dose of clonidine and thankfully that seemed to help her fall back asleep! She would vocalize off and on but every time I'd look at the monitor, her eyes were still closed and she was asleep! She woke for good around 7:30am and I found her in a SOAKED diaper, so that might explain some of her restlessness! She was sweet and giving me an occasional smile, but I could tell she was tense. Still very crunchy and more sensitive than yesterday. We definitely think her tummy is giving her trouble! As of yesterday she was dirty-diaper-free for 5 days, so I helped her go then and also this morning...we definitely think there is some cramping going on! Poor girl! This new formula is doing a number on her bowels (much harder)! I spoke with her GI doc today (who's been out for 2 weeks), and he thinks we should try increasing her milk of magnesia even more to try to get her going again! So that's the plan. We also spoke about possibly increasing the rate of her formula, in order to get her more calories (very slowly just a cc a day), but I'm still slightly hesitant to make any changes right now. I don't know. We've got a crazy busy week next week, and I'm so afraid to do anything that might rock the boat! We'll see. 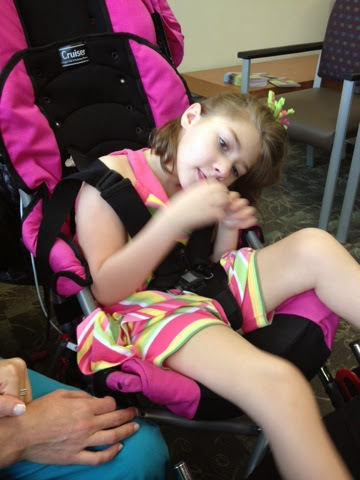 Next week she has 4 appts over 5 days AND another care conference with all of her doctors! I honestly have no idea what to expect right now out of her (good day/bad day wise)...she hasn't been following the 11 day cycle for a while now. This afternoon (after PT and OT), the seating guy came to add the new cushions to her wheelchair! She's growing and needed more space, there are still a few adjustments to be made, but there are a couple more things they have to order first! Her bed also needs a new motor for the bottom half (it's making a terrible noise), so they'll have to do that as well! Tonight Reagan was a little more sensitive again, but seemed slightly better after a dose of oxycodone and Ibuprofen. 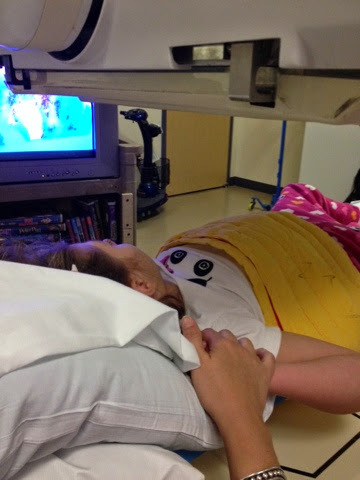 When it was time for bed, clonidine definitely seemed to aggravate her, but I held on to her tightly (she is ridiculously strong) and she eventually settled down and fell asleep. Unfortunately that didn't last once in bed and Daddy had to lay down with her to get her to finally fall back to sleep! Hoping and praying she'll get some sleep and wake up in a decent mood tomorrow!!! Reagan slept well last night and woke up this morning sweet and smiley again! She only had one therapy this morning, speech, and she was good for that! She was very crunchy today and the bean bag chair was definitely her favorite place to be! She could crunch up in a little ball and then drift off to sleep...which she did a couple of times! It was definitely an easy going, take it easy sort of day today! We even started some essential oil therapy for her with a new vapor mist diffuser Grandma got her! The coolest thing about it is it changes colors...very relaxing! We put a few drops of peppermint EO in it to try to help with her nausea/tummy issues! After her bath, she really relaxed and dozed off for a couple of hours (while her brother burned off some energy in the pool)! She woke up right around 7pm and was only awake for a couple of hours before dozing back off again. She was slightly sensitive tonight while awake and obviously still pretty tense in her body (hence the crunching), but otherwise OK. She fell asleep on her own tonight, so hopefully she'll stay asleep! Reagan slept well last night (even slept in a little) and then woke up super sweet and calm again this morning! 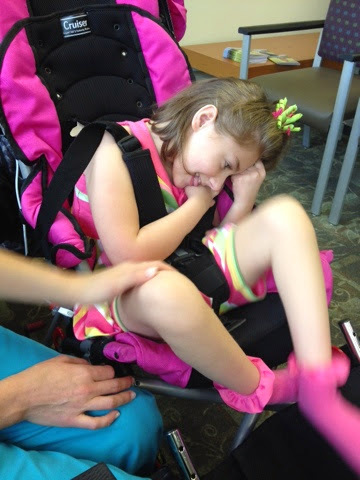 She had an early session of OT, followed by PT, both of which she had a hard time staying awake for. After she was finished with PT, she crashed and then slept hard the rest of the day (even sleeping through diaper and clothing changes)!! She woke around 7pm (slightly tense but still smiley) and was awake until 9:30pm or so when she fell asleep in my arms. Such a sweet girl. Didn't do much today, but some days she just needs her rest! Reagan had a really great day today. She slept well and woke up calm and collected! She's been super sweet and easy going all day (a little spitty/foamy but otherwise OK). She had OT and speech this morning and did well with both. Then this afternoon we decided to make another impromptu trip to the aquarium, when she's doing well, we've got to seize the day and do as much as we can! It was Grandma's first trip to the aquarium and she let Ryan run WILD! (Usually I try to keep him manageable and confined to his stroller!) He loved it! 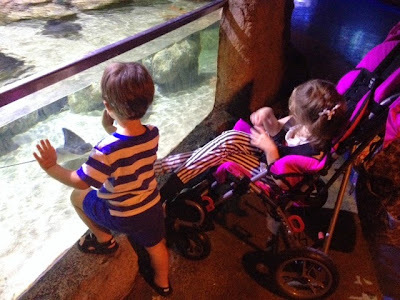 This is a small aquarium and they have a lot of "touch tanks", so he was sticking his arm in every tank he could reach! 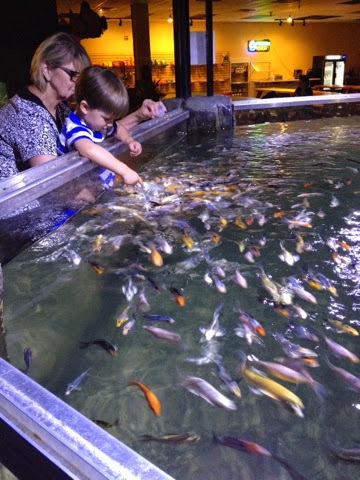 Grandma bought some shrimp to feed the rays, and they were coming up and nibbling on his fingers, he was in heaven! Reagan was pretty chill the whole time, I think she enjoyed herself, but she wasn't super animated, so it's hard to tell. Overall, another successful trip to the aquarium (glad we got those half price family passes)!! Tonight Reagan was very calm but still slightly spitty (but not at all nauseous). She finally dozed off with the help of clonidine...I hope she's in for another good night's sleep! Reagan slept well last night but when she woke up this morning, she was making some sounds and then all of a sudden just broke out into full blown tears!! I was just getting in from my walk, but I changed her and transferred her to her chair, where she seemed a lot more comfortable. I gave her a dose of oxycodone, but it didn't seem to much. She was still on edge (with the kooky laughs) after her nurse got here and eventually she gave her a dose of Ibuprofen. That seemed to finally settle her down. Around noon I noticed that the temp was only 85 degrees outside and it was overcast, so we decided to get Reagan into the pool! It did seem a little cool to me when we first got in, but once in, she really relaxed and seemed to be enjoying herself. 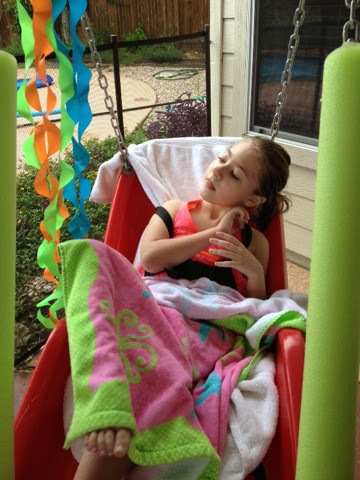 Afterward, she dried off and spent some time in the swing. Eventually she was kicked out by her brother, but that was probably for the best, because when we took her out we noticed that one of the straps had been poking her in the leg and she was pretty red! She was so super sweet though and had a really great rest of the day. Tonight I tried holding her again, because she was so super sweaty (and has cold clammy hands/feet), but she started getting spitty/chokey so I had to put her back in her chair. She was dozing off without any sleep meds, so Mike took her up to bed and laid down with her. I'm not sure if she'll fall asleep on her own or not, but it's worth a shot! Hoping for more good days this week for my sweet girl! Don't panic! All is good here, I've just been slacking with my blog posts! It's been a bit of a lazy weekend around here. Reagan slept well last night and woke up with the kooky laughs again today. She's been slightly on edge at times, but overall OK. Smiley and laughy with hints of being on edge. Tonight she really didn't want to be held, so she spent several hours on the floor kicking around. She got a lot of gas out and seemed to prefer that position for whatever reason! She eventually dozed off with the help of clonidine, so hopefully she'll get another good night's sleep tonight! Reagan slept well last night. She woke up this morning well rested but gassy! With my assistance, she had a large dirty diaper and must have gotten some relief from that. She was pretty calm and laid back right afterward but got more goofy as the day went on. Lots of laughs all day. Sweet laughs during the day and on edge, near tears laughs tonight. Not sure if her tummy was plaguing her again or what, but then she had more gas and another poo diaper and seemed to feel better afterward. Unfortunately we also had some real tears tonight as well. Poor girl! We just can't seem to get her comfortable! She's on that new (old) formula, but so far no improvement. It's definitely messing with her bowels (and not in a good way) and we're still seeing hints of nausea here and there. We'll see. Her GI doc should be back next week and we'll discuss what to do then, and her palliative care team is trying to get another care conference together in the next week or two so we can get ALL of her doctors together to talk about our options. I'm still leaning toward the ketogenic diet, but we'll see. Hoping my girl can get on track and have a good weekend this weekend. It's been a long time without any "real" good days! Please continue to keep her in your prayers! Reagan had a pretty good day today! She slept well, despite another tube leak that soaked her bed! I changed her and cleaned everything up without her ever waking up (again)! She slept in a little but woke up in a good mood. Not super smiley, but did give us laughs. She definitely preferred to be in the bean bag chair today or to be held (she was just too crunchy for the tomato chair)! She had OT, PT, and school today and did well with them all! She would vocalize here and there, almost as if she was speaking or trying to respond to questions. She was super snuggly and sweet, but not a fan of us talking amongst ourselves (tonight especially). She was yawny all day but didn't nap at all, and then tonight dozed off on her own around 9:30pm. Hoping for another good night's sleep and a happy girl tomorrow! Come on HAPPY! Nothing much to post for today! Reagan slept the ENTIRE day! That's right! All night (in her chair) and then ALL day (in her bed)!!! Thank God! Definitely an answer to prayers! It was such a restful sleep too...arms up over her head!! Her tube kinked at one point and caused her med port to pop open and leak all over her bed...she never woke up! Even getting her bed, outfit, and diaper changed out...she stayed fast asleep!! Sweet, sweet girl! She SO needed this! Praying she sleeps tonight and wakes up smiling tomorrow! My girl needs some good days!!!! Reagan slept off and on last night (in her chair of course). She was very restless (and still nauseous) so I'm not sure how much sleep she actually got. This morning she appeared to be feeling a little better. No real nausea to speak of, but looked oh so tired! Ibuprofen was the only thing that seemed to provide any relief to her. Right around 9am she dozed off and then slept HARD from 9-2pm. At 2pm she woke up and was wide eyed and a bit tense, not sure if she was still half asleep or what, but she settled down and looked a lot more calm after another dose of Ibuprofen (we just gave it around the clock yesterday). She was slightly tense last night (not a fan of music on tv or anything too loud), but otherwise good. She did make a few gaggy faces here and there, particularly when I would pick her up and try to hold her (to give her some time out of the chair)! Not happy to see any signs of nausea, but thankful it wasn't relentless like the day before. Tonight she dozed off in my arms after her pm dose of clonidine, but as soon as Mike tried to lay her in bed, she started freaking out! He had to move her to her chair and she didn't calm back down until after a dose of Lortab. Not sure if it was the clonidine itself (another paradoxical reaction) or if it was just her not wanting to lay down in her bed, but she was not happy! Once she settled back down, she did eventually doze off and appear to be fast asleep. Sad she's in her chair once again (but too afraid to attempt to move her), but happy that she's sleeping and praying she'll sleep through the night! I'm not sure how much Reagan slept last night! It was one of those extremely RARE nights that Mike and I got to bed before midnight and I think we both were out like lights! Reagan was wide awake and kicking around when I got up at 6:45am. I changed her and moved her to her chair and she was super sweet and all smiles. I got the feeling that maybe we were in for a really good day. She seemed fine all morning until right before speech, she made a couple of gaggy faces. She did OK for speech but then during OT she got very gaggy/retchy! Ugh, not again! After OT, she settled down a bit but as the day went on, the nausea came back with a vengeance. Tonight it was relentless. Nonstop gagging retching, where you have to hold a blanket in front of her face at all times because at any moment she could throw up all over the place (which she never did, but that was almost even worse)! She just kept making the mouth movements, curling her lips in as to try to cup the excess spit in her mouth...meanwhile she gags and chokes on that spit and goes precious moments holding her breath because she can't breathe past it! She crunches forward wiping her head back and forth on her legs (because I am holding her arms down to keep them out of her mouth and face). When she tries to lean her head back to rest, she gags again because the spit starts dripping down her throat. It's painful, painful to watch. And it's a vicious cycle that just wont end! I tried giving her Lortab and yes it did make her sleepy, but the nausea just kept on and she wasn't able to fall asleep. I don't know if it was the frustration or what, but then she started crying. A miserable, sad sad cry! I picked her up and held her but the crying continued and so did the nausea (although to a lesser extent while crying). I tried clonidine an hour or so later, but that didn't seem to help either. Finally 30min later, Mike picked her up and held her and she fell asleep on his shoulder. Unfortunately the transfer didn't go so smoothly and she was back awake and crying again. I broke out my last big gun...ibuprofen. I gave her a dose and not 5 min later, she was asleep. She definitely seems to be in pain! I'm sure just the pain in her throat alone (from all the retching) is enough to make someone cry! Please say some extra prayers tonight for my poor sweet girl! We just HAVE to come up with something to prevent her from going through this hell! Reagan slept well again last night. She woke this morning around 7am and I could hear her making kooky noises. It's been another kooky day for her. Very similar to yesterday, she's been super sensitive to noises, and we've had to whisper around her most of the day! She seemed to prefer her bean bag chair today (over her tomato chair), but she also did well on the floor. Just another odd day. Things are definitely "off", but she's beautiful and sweet and doesn't appear to be in any immediate distress, so I guess I'll take that. 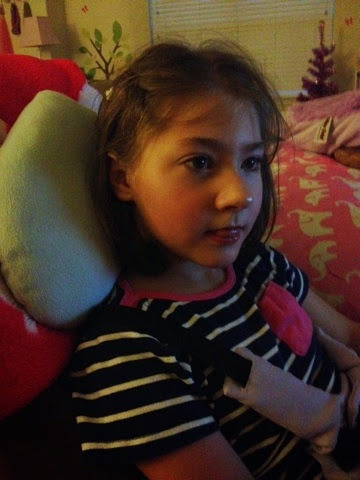 Tonight she seemed a little less stressed/sensitive and did fine downstairs with her crazy brother and loud tv. She was getting super sweaty again, so I put a blanket down and let her roll around on the floor. In her chair she'd kick around like crazy, and on the floor she'd roll on her side and just lay still for long periods of time, so it was definitely better. Tonight she was pretty restless and waking back up in bed, so I have no clue how much she'll actually sleep tonight. Reagan slept last night! She woke up this morning a little kooky and she's been that way ever since. She's smiling, but we've had to be careful around her with talking and noises, she's very sensitive. Her body is very tense and shaky and she's sweating a lot. She has been good on the floor, so several times today we've let her roll and kick around on the floor for a while (keeps her from sweating her back wet in her chairs)! Tonight she also did well with me holding her. It really seemed to calm her down. She tried to doze off on her own, but woke back up 10min later or so and couldn't fall back asleep. I finally broke down and gave her a dose of clonidine (I'm still really nervous about it after what happened the other night). Thankfully, it worked, and she was asleep a few minutes later. Hoping she can get some more sleep tonight and wake up a little less tense tomorrow! I think Reagan slept fairly well from midnight to 4:30am (that is, after she got a dose of oxycodone and made it past the major clonidine freak out)! But I gave her another dose of oxycodone at 4:45am and I don't think it did a thing. She was awake and moving around when I got up to run at 6:30am, but by the time I got back from my run she was asleep (only for 30min or so, but I'll take it). Anyway, she was fairly nauseous all morning. No actual retching, but lots of "gaggy" faces and cupping her lips to try to contain the spit. Despite the nausea, she definitely seemed to be in better spirits. Both OT and PT came and worked with her, did a lot of stretching, since she's been so crunched up lately (and spending so much time in her chair). She was definitely looking sleepy after therapy, and she was FULL of yawns, but her body/nausea just wasn't letting her sleep. Finally, just before 3pm, she dozed off on her own. From 3-10pm she slept like a rock, only moving a couple of times, but going right back to sleep. We were afraid to touch her, but at 10 we decided to try to move her to her bed. I don't know if it was just the act of moving her, her nurse trying to check her vitals before she left, or me changing her diaper, but she woke up and then wouldn't go back to sleep! SO frustrating. She was smiley, but still making a lot of mouth movements so I really didn't feel comfortable leaving her flat in her bed, so I moved her back to her chair. It's not looking good for sleep tonight for my girl, which makes me very sad. I'm happy that she seems to be feeling better and that she got some sleep today, but I really wanted her to sleep tonight! Prayers that she would get the sleep that she so desperately needs! Quick post...Reagan's mood was much improved today, we even got quite a few smiles, but her nausea was off the charts. Constant gaggy faces and persistent gagging and retching (and three big throw ups). This afternoon I finally caved and decided to give her clonidine, thinking if we could just get her to sleep, she'd get done relief from the nausea. Instead she had the WORST paradoxical reaction I've ever seen! She went from calm and gaggy to irate and miserable! It was awful. It persisted and then even as she was getting sleepy, she would wake back up gagging and thrashing! Just beyond terrible! Please say some prayers for her tonight! It's been another rough day for my sweet girl! Terrible awful no good very bad day (and especially night)! Ugh. That's all I can say. Last night was ridiculously bad for my girl! I can't remember the last time she was that miserable! Big, hard, gut wrenching cries...not just pitiful moaning...she was definitely in pain! She cried all night long, only sleeping for 5-10min at a time, usually right after a pain medication (that's how long they worked 5-10min or not at all)! She continued to cry nonstop, every waking moment today as well (this morning and afternoon anyway). She did doze a little off and on this morning, but again, not longer than 15min or so. She seems to prefer having her body crunched up (knees up to her chest) and she's just SO crazy tense! She's also doing a lot of smacking/swallowing with her mouth, which might indicate nausea, but I sure hope not. It's just been an awful day/night for her. Unless you see it, I don't think you can clearly understand how heartbreaking it is to watch. I had to reschedule her EKG that was supposed to be repeated today, we're going to do it Friday instead (hopefully she'll be better by then). We did, however, move her previously scheduled abdominal ultrasound to today so that we might catch something going on internally during one of these episodes. Reagan was still very upset when it was time to go, but I scooped her up and loaded her into the running car and within a few minutes she was already dozing off! She was very calm and slept most of the way there. Unfortunately that didn't last once the ultrasound started! She fought like a tiger! Her nurse and I both had to hold her down and she still got away from us at times! Crying, kicking, flailing, biting...hopefully the ultrasound tech was able to get what she needed! Afterward we got her back into the car and immediately she started dozing off again! I don't know what it is about the car, but maybe we should have tried that last night? (She's never been a kid to fall asleep in the car!) Anyway, when we got home, she was noticeably more calm, but not as calm as she was in the car! And she did escalate a bit as the night went on. You could tell her pain meds must have been wearing off because she kept tensing up as if she was fighting off waves of pain! Poor thing! She did start dozing after I gave her some clonidine, but her brother's craziness woke her back up (and she was NOT happy)! I just gave her some oxycodone and she's now sleeping peacefully in her bean bag chair, although her beeping pump did almost wake her up again! Praying she'll be able to stay asleep and get some rest! I can't even imagine how exhausted her poor little body must be right now! Please continue to keep her in your prayers! Reagan eventually fell asleep last night, after A LOT of laughing and carrying on. She slept, but she was a little restless. When I got up this morning at 7am, she was wide awake laying in bed! She's had a fairly good day today. Still some things are off, she's tense in her body, still clammy, and sensitive to us talking amongst ourselves (instead of to her), but overall she's been good. Very laughy again. She had speech today and it was hard to get her to focus on anything, but she did OK. It wasn't until this afternoon that things started escalating. She was getting increasingly tense. 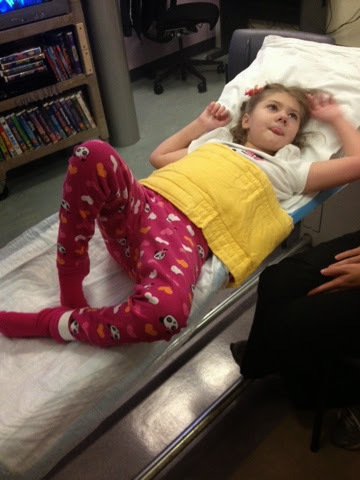 Her nurse checked her temperature because she felt a little warm, and she had a low grade temp (99.4). She decided to give her some Lortab to try to help calm her down and reduce her fever. Unfortunately, calming down was not in the cards! She was getting increasingly vocal/agitated, so Mike went upstairs to try to calm her down (I was cooking dinner). That didn't work either! She quickly went into full blown crying and wouldn't stop! When I finished with dinner, I went up with her and was able to calm her down. 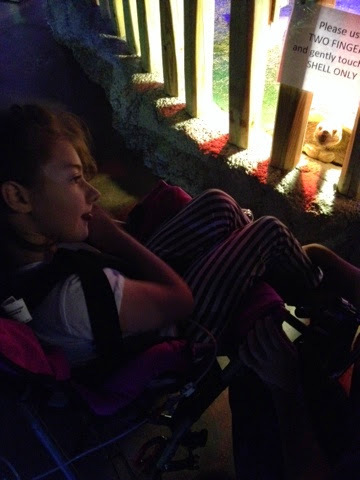 She was relatively calm (still tense but quiet) for the next couple of hours. It wasn't until I gave her her pm dose of clonidine that she freaked out again! About 30min after she got it, the tears started up and then didn't stop! I tried Lortab, but it wasn't helping either! Ugh. We're in for a rough night tonight! I hate to see my girl suffer like this. You can definitely tell something is hurting her...but we have NO idea what?!?! Please keep her in your prayers! Reagan slept well tonight (as far as I know anyway). She's been good today, albeit a little kooky. Still pretty stiff and with some overall clamminess. She seemed OK with her brother and all of his craziness, although she did get a little vocal at times! We even took some pictures of her sitting on the swing with him (and Grandma) that turned out pretty cute! She looked like she was "holding" onto him, but in reality she was just trying to get to her hand! Very "into" her had again today...she's got a big blister on her finger that will vouch to that! Tonight we had planned to head over to a Round Rock Express game (Mike had gotten free tickets from his boss). Reagan's nurse was going to stay late with her and we were going to attempt a later than usual outing with Ryan! We drove all the way to Round Rock, were maybe 0.5miles from the stadium, when Mike realized he left the tickets at home! We turned around came all the way back to our house (30-45min) and got the tickets. We were headed back again when Mike glanced down at them only to see that the tickets were for yesterday's game!!! UGH! So needless to say, we weren't too happy (except for the fact that he noticed it before we got too far)! Instead, we went and had a nice dinner and then came back home! That was enough excitement for the day. Reagan saved her poo up until we got home! She only had one today but it was a leaker! Between her and her brother, we've got some carpet cleaning to do! She's been very vocal/laughy tonight, so I'm hoping she'll settle down and get some sleep! Reagan slept well last night but woke up this morning (while I was out on my run) with a bed full-o-poo! Poor girl, and poor Grandma and Daddy who had to clean it all up! As it turns out, today was destined to be a day of poo, with FIVE expolsive diapers (three of which resulted in major cleanups)! 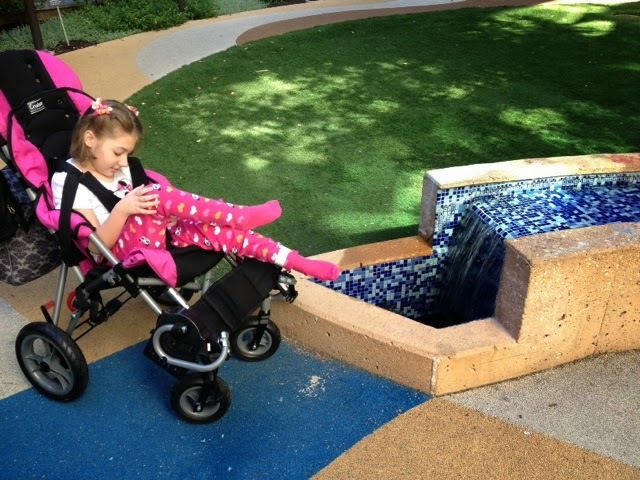 Her nurse had to do one completely unassisted, which is VERY difficult. And the third ended up all over the carpet! (Lots of laundry today!) Talk about excitement (the wrong kind though). Turns out there was a minor misunderstanding about her dose of milk of magnesia, the doctor wrote out the order as 3x her regular dose, and obviously that was WAY too much! Anywho, her mood today has been pretty good (not great, but good). 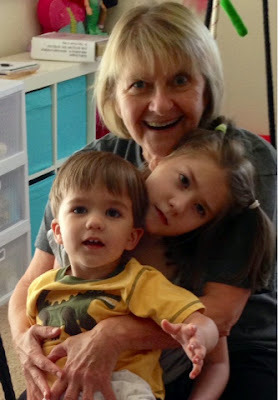 Giving smiles and laughs here and there, especially for Grandma! Tonight and this afternoon she's been a lot more sensitive to noises, we had to turn the tv down on several occasions just to try to avoid a meltdown. Tonight she dozed off on her own and was easily transfered to her bed. Hoping for a good night's sleep without any more "surprises"!! 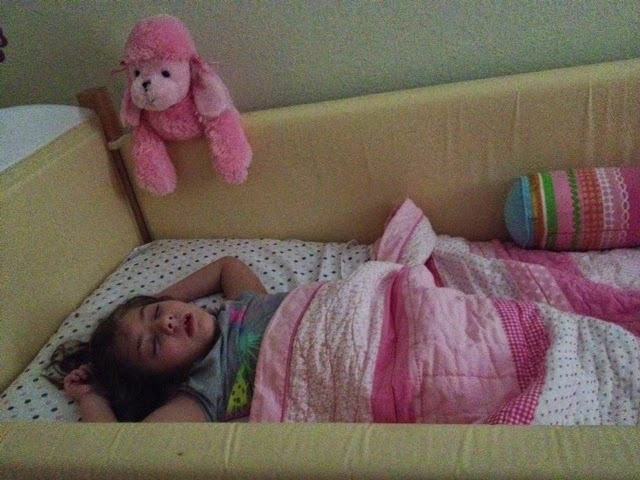 Reagan slept well last night (in her bed)!! She woke up this morning still very serious, but less scowly. A little licky/mouthy but that was the only sign that might be an indication of nausea. Very tense and crunchy...she seemed to prefer to be held, rather than being in her chair. She ended up having a big poo diaper (thank you milk of mag increase) and then afterward was much more relaxed and calm and actually dozed off right before speech (she has a knack at falling asleep right before therapy)! She was smiling off and on in her sleep, so we were hopeful she might wake up in a better mood. She slept for a while and then woke up Meanwhile, I had just recieved an email from the GI nurse telling me that we needed to lower Reagan's nortriptyline down to its previous dose because her EKG came back with a "non-specific t-wave abnormality". Of course, she couldn't tell me anything about that and what it means (could it have been an error in the recording, could it have been due to her high stress and nausea that day)!?!? After some freaking out on my part, the nurse did eventually speak with the cardiologist who said "that the finding can mean absolutely nothing, that the QT interval Is what he is usually more concerned with and hers looks good. So we will repeat the EKG in one month". So for now, we just have to leave her medication at the lower dose (that wasn't helping her) until her doctor gets back on Monday! And FYI, I'm not waiting a month to do another EKG! I'm going to push for one next week so we can confirm whether this is a real issue or not! I'm still really annoyed! :( Anywho, Reagan pretty much slept the whole day through today! Hoping she'll keep sleeping through the night and wake up feeling better tomorrow!